Complete coverage of all aspects of dining room service, with real-life examples and updated information on technology in the industry. 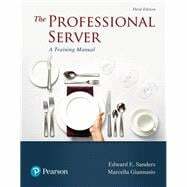 In The Professional Server, students get an introduction to the many aspects of being a professional server, and experienced servers get an excellent reference to consult for various techniques and service situations they face in their day-to-day work. This popular resource features easy-to-read, self-contained chapters, which flow in a logical sequence and allow flexibility in teaching and learning. Coverage includes areas such as professional appearance, guest communication, table settings, food, wine, and beverage service, and current technologies. Restaurant Reality stories and step-by-step photographs give students an insider’s look into what makes an effective server. Edward Sanders is an adjunct professor of Hospitality Management at New York City College of Technology. He is a Certified Food Executive and Certified Purchasing Manager and has a Master of Science degree in International Management from Thunderbird School of Global Management and a Doctor of Business Administration degree in Management and Organization. Through his career in business and education he has been associated with Xerox, Sky Chefs-American Airlines, Marriott, Delaware North, Brigham Young University, Oregon State University, and Southern Oregon University. Ed owned a restaurant, operated a chain of restaurants, founded and operated Hospitality News (1988—2006), has been an associate professor of business, and cofounded and directed a hospitality and tourism management university program. He is also the author of Food, Labor, and Beverage Cost Control (2016, Waveland Press)and the lead coauthor of Catering Solutions for the Culinary Student, Foodservice Operator, and Caterer (2000, Prentice-Hall). Marcella Giannasio is an Associate Professor at Johnson & Wales University, Charlotte, North Carolina, and teaches in the culinary department. She has also taught and supervised students in Koblenz, Germany, at the Deutsche Wein und Sommelierschule, and At-Sunrice Global Chef Academy in Singapore, and participated in the Banfi scholastic tour in Italy. Marcella is a graduate of the College of Charleston and earned a master’s degree in management from Southern Wesleyan University. Her certifications include: Certified Hospitality Educator through the American Hotel & Lodging Educational Institute, Foodservice Management Professional through the National Restaurant Association, and a Court of Master Sommelier Level1. She is a Bordeaux wine ambassador and holds an advanced wine & spirits certification from the Wine & Spirit Education Trust Limited based in London, and is a Hospitality Grand Master through the Federation of Dining Room Professionals. She joined the Johnson & Wales University faculty in 1997 with having many years of management experience within the hospitality industry. What is happening with tabletop place settings? Work Smart or Work Hard?